Monday, Monday! So Good To Me! At Party Machine Celebrations we are frequently asked about ways to reduce the cost of a nice wedding. The single biggest factor is simple: choose an “off” day to host your event. Just as airlines and vacation resorts offer peak and off-peak pricing, experienced wedding vendors do also. it’s simple supply and demand, as there are not enough Saturdays in the spring and summer to go around. As of mid-October, I have already turned away seven client inquiries for May 7. But there are plenty of January dates open, and attractive discounts available from many vendors. 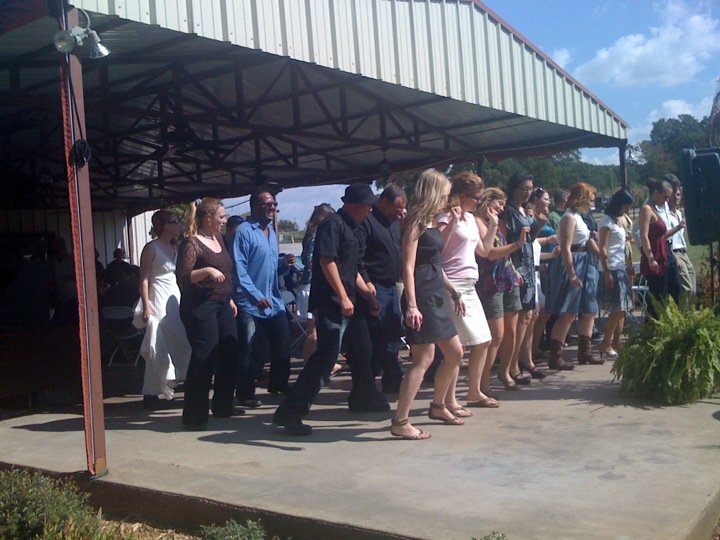 Yesterday I did my first-ever Monday Noon wedding, outdoors at Lost Oak Winery in Burleson. Matt and Rose chose the day partly to save money, and it was not only an excellent plan, but turned out to be a fantastic celebration at a beautiful place. Monday is normally a day for bookkeeping and office activities for an entertainment professional, but yesterday was different. I had an early morning meeting with a new wedding client for a Summer wedding, then left to MC for Matt and Rose. The stark contrast: Matt and Rose had a celebration that cost only 10% of the big summer wedding! Granted, there are other major factors affecting cost difference: the summer wedding will have more guests and a larger sound system, elaborate lighting, special programming, full-service videography, and 4 staff persons. But all things being equal, a simple Monday daytime wedding would still be HALF the cost. And the Monday wedding was great! A beautiful fall Texas day, comfortable with a nice breeze. Guests sat under a covered pavilion, but the dance floor was the sunny end of a patio, and it could not have been any nicer. And, yes, people laughed and danced and had a great time, even in the middle of the day! It was sort of fun to feel like you were ditching work to go to a fun party. We even joked about returning to the office on Tuesday with a tan, and telling co-workers it was from dancing at a wedding. Monday mid-day dancing beats a good day at work! Many are unwilling to abandon a Saturday date, just to save cost, often fearing that guests will not come because it’s not convenient. While this can hold true for other events, your wedding is special and unique, and your loved ones WILL show up, no matter when you have it! Plenty of people might have to miss a Saturday date also – sometimes because they must attend multiple weddings. If you plan it, they will come – most of them, anyway, no matter what day you choose. Standing firm on a date can not only cost more, but can lead to other problems. All of the top vendors get booked up early, and staff is spread thin on the popular dates. This often leaves temp workers or the “B-Team” in charge of your event, and can be disastrous, especially with entertainment. Many people pay too much for a cheesy, amateur hobby DJ for a Saturday in June, when they could easily afford the Party Machine for an off-peak day – and we all know that it’s the entertainment that will make-or-break any celebration. Matt and Rose had a western theme that was both down-home casual, yet elegant. They made their getaway by motorcycle, down a service path in the grape vineyard, as the Party Machine music? Yes, you “Heard It Through the Grapevine.” Every guest will remember this wedding celebration! It doesn’t have to be costly to be unique, memorable, and FUN. Do you know someone planning a wedding on a budget? (Don’t we all?) Call me at Party Machine Celebrations at 817-294-9539, and don’t assume you can’t afford experienced professional entertainment! We have numerous cost-saving solutions and ideas, and will always work with your budget. This entry was posted on October 19, 2010 at 2:24 pm and is filed under Weddings!. You can follow any responses to this entry through the RSS 2.0 feed. You can leave a response, or trackback from your own site.